The Real Estate Board of New York (REBNY) has been aptly described as one of the worst institutions to ever plague New York City. Its top policymakers are often referred to as a bunch of billionaire bullies and racketeers who are Ravaging Every Borough of New York City. 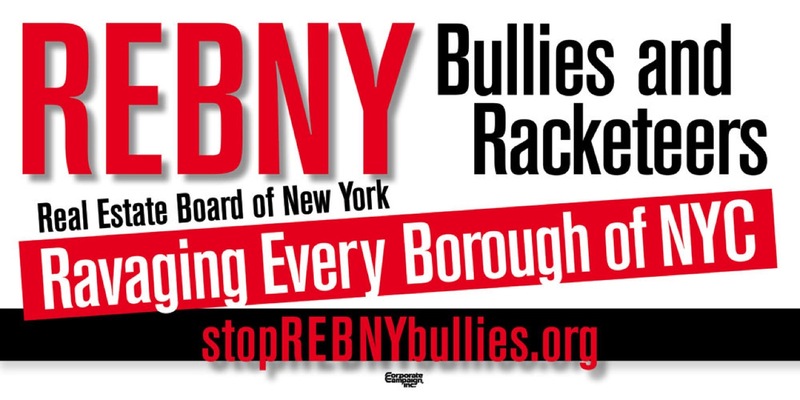 To learn more about our Campaign to Stop REBNY Bullies aimed at curtailing REBNY's abuse of economic power and its political dominance over governments in New York City and New York State, please visit our website www.stopREBNYbullies.org. If your city and/or state are under attack by real estate lobbies and the property speculators, developers, landlords and financial institutions behind them, please email us at info@CorporateCampaign.org or call us at 718-852-2808.